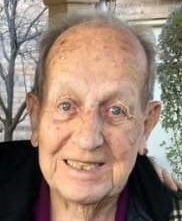 Age 94 of Crest Hill, IL, passed away peacefully on December 15, 2018 at Presence Health St. Joseph Medical Center. Born January 20, 1924 in Joliet, IL, Raymond was a son of Joseph, Sr and Mary (nee Windischman) Gestel. He was raised and educated in Joliet, and graduated from Catholic High (Joliet Catholic Academy High School). Raymond joined the Marines and was active in World War II from 1943-1945 in the South Pacific. Ray was employed as a Pipefitter, Local #597 (Chicago) until his retirement. Cantigny Post VFW #367 and a lifetime member of the Joliet Rivals A.C.
Ray was a devout Catholic with a strong faith in God. In Ray’s free time, he enjoyed Wednesday mornings at McDonald’s, taking time to visit his family, attending the Concerts on the Hill at the Joliet Bicentennial Park, playing poker at Willow Falls with Ron and Stan, Pokeno and Bingo. A special thanks to his longtime friends; Bob & Rosemary Rogel, Ron Noble and his primary caretakers, Autumn and Lu. Survivors include his great niece; Stacy Ambrozich, as well as numerous great nieces and nephews. He was preceded in death by his parents, siblings; Genevieve (Anthony) Bortoli, Helen Roberts, Margaret (William) Pasdertz, Mary (Leo) Thompson, Dorothy Gestel, Rita Gestel, Joseph (Mildred) Gestel, Jr, William (Marilyn) Gestel, Fred, Emil and Arthur Gestel; special niece - God-daughter, Kathleen M. Ambrozich and nephew, John Gestel. Funeral services will follow at 10:30 a.m. in the funeral home chapel with Rev. Richard Prodehl officiating. The United States Marine Corp will render military honors following the service. Raymond will be laid to rest at St. John the Baptist Cemetery near his parents and siblings in a private ceremony following the funeral service. Funeral services and arrangements have been made under the direction of Kenneth A. Plese, in Joliet, IL 815-735-2125.